The apprentice relationship must first be put into perspective. For the most part, it is presently not the same as it was many years ago or still found to be in some cultures. In Japan for example, a typical experience that spanned 5-10 years was the equivalent of securing a lifetime position in a company. Perhaps the first year was sweeping floors another year of wedging clay and then little by little beginning to make work for the studio until, by the end, the apprentice would be fully prepared to open a studio of his or her own having learned all that is necessary through the body rather than the intellect. This scenario works if one is willing to stay the full time, buy property in the area of the teacher, and make work that is recognizable of the ceramics of that teacher or pottery town. If in fact the relationship is altered, then all the conditions are effected. If for example the length of time is shortened to 1 year, then the apprentice might only get to sweep floors in which case the value of the experience will be considerably diminished. Or if the apprentice leaves the area or chooses to make work that is different then what the teacher or studio was producing, the apprentice looses the patronage that would other wise be extended from the teacher and teacher’s patrons to the apprentice. This is not to say that there is no place for such a relationship in our society or culture. It is just a matter of adjusting the conditions and expectations. In our present society, there area number of different approaches to the apprenticeship. Speaking for myself, I am not interested in having an apprentice make my work or the studio work. I am not a production potter. In my circumstance, the apprentice gets out of the relationship what is put into it. 2 years is suggested, but there is a discussion close to the end of the first year to be sure that it is working for both teacher and apprentice. A good work ethic is essential. I can get by with someone who is only interested in putting in the time to work, but this is not the most beneficial approach for the apprentice. I am not as interested in teaching technique such as wheel or forming. This will happen if the apprentice watches carefully and is motivated to learn ( through repetition) I think that the time can be best spent( once the studio work is completed) by taking risks, experimenting and thinking of the situation as though it were the actual studio of the apprentice. In other words, to be thinking for oneself as to what needs to be done rather than waiting to be told. One example of this became apparent when I was loading the tunnel kiln a number of years ago. 2 people had come to “try out” for the position of apprentice. One was a young American kid and one was a young Japanese kid. I was inside the kiln thinking about what to do next. I was about to look back to ask for some rice hulls and when I turned towards both of them, there was the Japanese kid with a small bucket of rice hulls in his hand and there was the American kid with a look of anticipation on his face asking what he could get me! Both were passionate and enthused but one was thinking as a worker and one was thinking as if it were his responsibility to make decisions. I believe that a person apprenticing here should leave with as much experience as possible. Firing , loading, building kilns etc, but developing approaches to being a potter/ artist. This is the time to work through ideas, to develop prototypes and bodies of work. To be measuring kilns, studios, to get an understanding of what it takes to run a studio, to build lists of potential material suppliers, galleries, to test glazes, slips and clays so that when the time comes to leave, that there is a base to build from on a number of levels. Even if the situation is not what was expected, there are valuable lessons to be learned from the experience if only to realize that this could be done differently. Following is a list of previous apprentices and the available contact information. – We base the relationship on 2 years, but a 1 year minimum is required. – A perspective apprentice must have an introduction from a reputable person in the field. – Chores are: cleaning the workshop first thing each morning, preparing clay: wedging, or stretching slabs when work is being made. 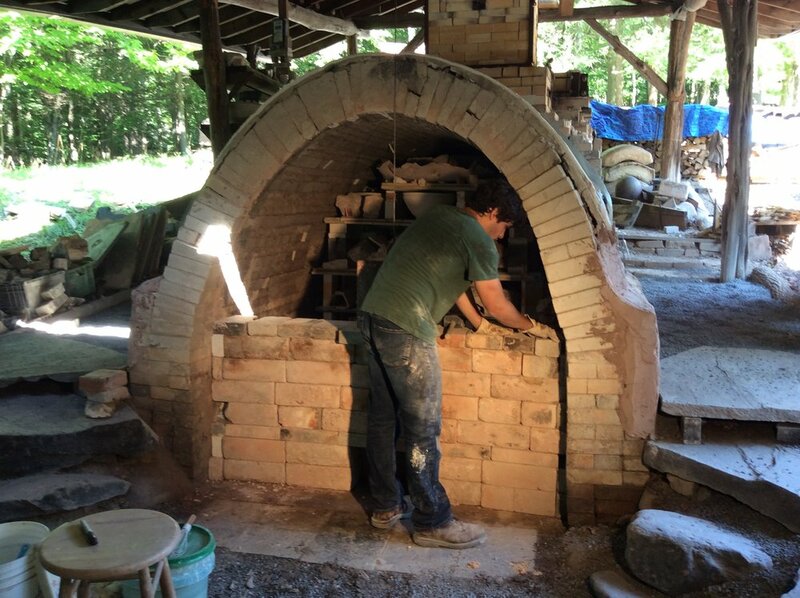 In other parts of the year, it may be cleaning and preparing the kiln for loading, firing( 3 kilns: 1 is the large anagama -8 day firing, 1 is a small wood/gas kiln-24 hour firing, and 1 is an electric kiln. There is also a small wood/gas experimental tube kiln). The apprentice partakes in all aspects of the studio as well as loading and firing, but the final work is made by me. No work that is sold from my studio is made by the apprentices. The apprentice is encouraged to have work of their own available for sale during our studio show in October or November. – On occasion the apprentice can begin his/her own work at 3:00 but the general rule of thumb is that the apprentice has the evenings and weekends to work on their own, beginning at 5:00 during the week and most times on the weekend. – As this relationship is not that of a mere worker and there is involvement with my family such as being invited to occasional dinners and events as well, sometimes there are occasional requests to help out with garden and yard assistance. – Food and ceramics are strongly connected, and the food experience here is a good way to experience ceramics as well. My wife Hinako is a wonderful cook and enjoys making dishes when there is an appreciation for it. Basically, you take away from the experience what you choose. If fulfilling the basic needs of the studio during the work day is the extent of commitment, then this is what you will learn, but if you think about problem solving and try to think ahead rather than waiting to be told what to do, the experience will be more fulfilling.